Apple liqueur made with clean apple juice and double distilled grain spirits. Clean and clear, made with triple distilled grain spirits. The original Kümmel from Berlin. Rich, smooth and sweet honey liqueur. Germany’s oldest dry gin, flavored with juniper. Distilled from grain and potatoes, flavored with a hint of caraway, dill and coriander seeds – the water of life. Classic brandy from wines from the River Rhine, aged in small oak casks. Clear pear flavored brandy from the Black Forest. Clear Black Forest cherry brandy. A Bavarian farmers treat distilled from pears and apples. The classic apple brandy from Normandy. Sweet cinnamon liqueur with 24k gold flakes. Clear, sweet peppermint liqueur with an intense flavor. Dark red with more than 90 fruits, berries, herbs and spices. 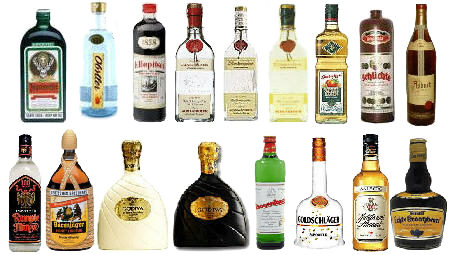 Germany’s classic herb liqueur with secret herbs and spices. From dark and bittersweet, to milk chocolate and white chocolate. *Also available are Scotches, Bourbons and Canadian Whiskeys, Rum, Tequila and Gin from famous distilleries.